A change of dining plan for tonight meant a quick dash to the English Market this afternoon and to the Frank Hederman stall in particular. The aim here was to secure a couple of their tempting Fish pies (Smoked haddock, spinach cream, lovely mash). That accomplished, I made a call to On the Pigs Back for some Bayonne ham and Arbutus Sourdough. 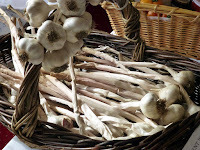 Great to see the West Cork Garlic on sale there. Made a quick dash to the chemist then to get some Senna Leaves and Wrights Coal Tar Soap. Only joking! Instead, I enjoyed a lovely reasonably priced cup of Maher’s coffee and very friendly service in the Arthur Mayne Wine Bar (which features quite a lot of old pharmacy related items). Nearly jumped going up Bridge when a chorus of police sirens broke the peace and quiet but they were just escorting a big bunch on a Cancer Cycle. Just your typical Saturday afternoon downtown. The next Hayfield Manor Wine Society takes place on Thursday, 11th October 2012 at 7.00pm. The evening begins with aperitifs and an introduction to wines by Noel Tymlin from Findlater Wines followed by a 5 course menu with a different Italian wine per course. 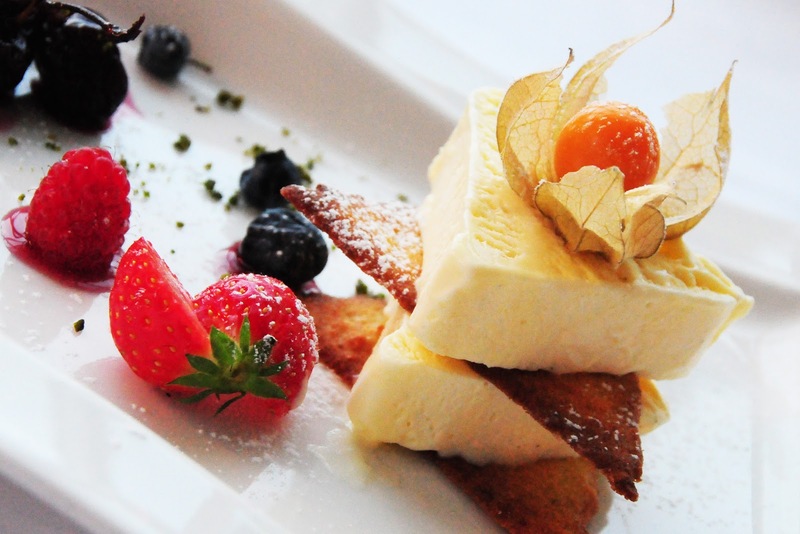 Dinner is €79.00 per person and is served from 7.30pm with five different wines to match each course. Limited spaces are available, therefore an early reservation is strongly recommended. Wine Australia is delighted to be hosting another delicious wine tasting in Dublin on Thursday 11th October. The tastings will be presented by Irish Times wine writer John Wilson and Wine Australia’s John Mc Donnell and the Dublin event will be hosted in ely Bar and Brassiere, Custom House Quay in the IFSC between 7pm and 8.30pm while the Galway venue is The Kitchen Café & Restaurant. The wine line up will include some of the great wine styles that Australia has become known for, as well as a few unusual offerings to challenge the perception that Australia only makes Chardonnay and Shiraz. The cost to join the tasting is €25 per person and please use this Irish Times link to book directly. With some delicious nibbles served during the evening this should be another fun, and tasty, event. Places are limited so please book early to join us for a great night. 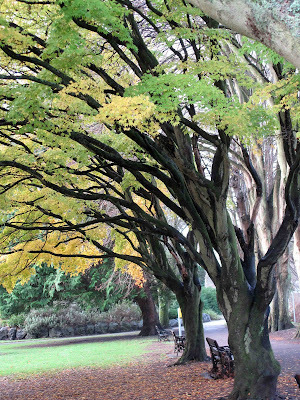 DUBLIN, Date; Thursday 11th October, Time: 7pm – 8.30pm, Venue: ely Bar & Brassiere, Custom House Quay, IFSC, Dublin 1. Cost. €25 per person. Bookings: Direct with the Irish Times (link above). GALWAY, Date; Wednesday 10th October, Time: 7pm – 8.30pm, Venue: The Kitchen Café & Restaurant at the Galway City Museum, Spanish Parade, The Latin Quarter. Cost. €25 per person. Bookings; Direct with the Irish Times (link above). The Many Faces of Australian Shiraz. Winemaker Tim Adams is back in Dublin and brings us on a tour of Australia on the good ship Shiraz. Our tasting aims to challenge the perception that there is only one version of Australian Shiraz. We hope to show that region, sub region, winemaking, vine age and vintage all contribute to more than one style of the variety from Australia. The Ballymaloe Sherry event has been postponed from October until the New Year but don't despair, they have a major event early in November. with the owners of Fontodi, Selvapiana and Villa di Capezzana, and ‘New Seasons Tuscan Olive Oil’ launch, with the owners of some of Tuscany’s iconic Olive Oil & Wine Estates, including Bea Contini Bonacossi, from Capezzana, Carmignano; Federico Giuntini, Selvapiana, Rufina; Giovanni Manetti, Fontodi and David Gleave MW of Liberty Wines. €24 (includes new season's Olive Oil presentation & Olive Oil tasting; and Tuscan wine presentation & tasting, and nibbles). Contact details here. Jim Crowley Butchers. Multi-award winners. The outstanding treat that I enjoyed at the recent Midleton Food Festival came from the Jim Crowley Butcher stall on the main street. I had met joint owner Criostoir O’Crualoai a few days previously and he had told me to watch out for their Steak Sandwich, also a hit at the previous year’s festival. So I did keep an eye out and soon found the stall, along with Criostoir and his friendly crew. Just have to say that the steak sandwich was terrific, even at a comparative early hour of the day. So tender, we were able to gently tear it in two, the better to share. Tender, and tasty. 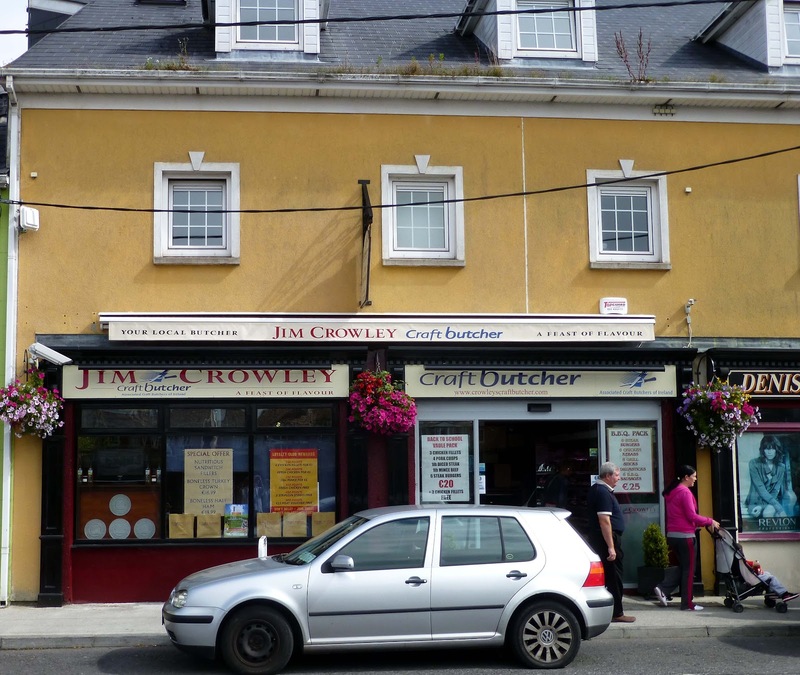 While a well placed source in the food industry later told me that Crowley’s have a loyal following in the area, I had never heard of their shop (on the Mill Road) before meeting Criostoir. After the festival, I called up there and met another friendly bunch behind the counter. The shop was neat and sparkling with a great selection of meats on sale. But I were after the shop’s pride and joy: their pork, chorizo and mozzarella burgers. Took them home and cooked them up and enjoyed them - just the right amount of chorizo to spice up the pork without overdoing it. Quite a chunky burger too and good value. And they are gorgeous. Don't take my word for it. It won second prize in May in the ACBI national barbeque competition! And that is not the only award that Crowley’s, owned jointly by Criostoir and Jim Crowley, have won in recent years. You can see the list here and it includes five Bridgestone’s in a row, the most recent for 2012. 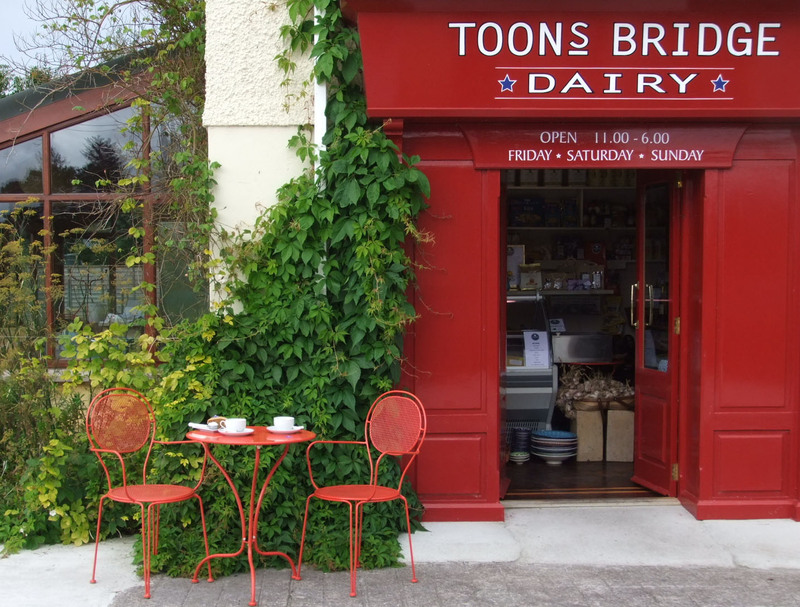 The Midleton Food Festival may come around just once a year but you can visit that sparkling welcoming shop on the town’s Mill Road all year round. Worth a detour! The Margaret River visited East Cork yesterday. After cricket and a kite surfing demo on the lawn, the action in Ballymaloe moved in to the Grain Store where Australian wine legend (and founder of New Zealand’s Cloudy bay) David Hohnen produced a team of six scintillating wines, three in white and three in red. David, of McHenry Hohnen, is a brilliant speaker for an occasion like this, delivering solid information with wit and with sharp brevity. He did repeat himself a bit though. Well, just one phrase. “Take a step back.” He was talking passionately here about letting the wine “work itself out” and was a bit worried that modern technology and courses were giving students both the knowledge and the means to interfere too much in the process. He did some interfering himself though when he started off in 1966/67, when varieties were not mentioned on the bottles. In the morning, they made claret; at lunch-time, they added dye and so made Burgundy in the afternoon! David is a firm believer in blends, believing that they can add up to more than the sum of their parts and that belief was illustrated by four of the six wines. And from one timber to another. Oak has its uses, he said, but as a container. “We don’t seek to add aromas, texture or flavour via the barrel.” They import older used barrels and the oak, at that stage, has little influence on the wine. Once again a superb set. The Shiraz was “very much Shiraz, lovely, clean and sharp, made from Autumn ripened grapes.” Important if you are looking for good Shiraz to watch out for areas where the grapes ripen in Autumn, was a tip from David. The 3 Amigos, with a very rich mouthfeel and a long finish, was a brilliant blend of Shiraz, Grenache and Mataro (Mourvedre). For me, the real class in the glass came with the Tiger Country blend. Tempranillo is the main grape here and it shows. 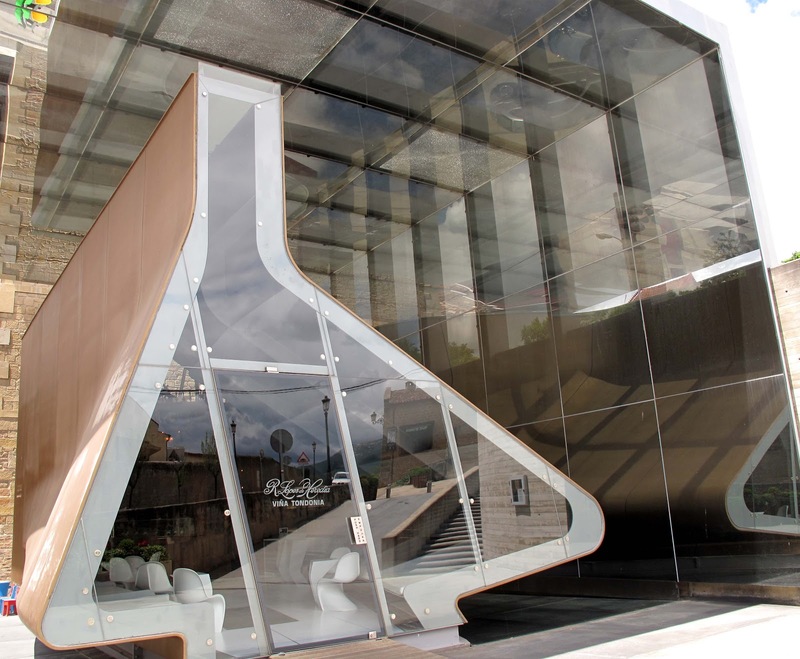 It has power and elegance, is supple and silky with a persistent finish. “Tread carefully,” they say, “this Tiger’s got some savoury bite!” Well worth the risk for 24 euro. The wines, priced from €19.00 to €26.00, are available via Tindal Wine Merchants. Rounded off with a delicious Harvest Supper, it was another terrific night in Ballymaloe and well done to David, to our host Colm McCan and his colleagues and to William Tindal. The Ballymaloe Sherry event has been postponed until the New Year but do watch out for the An Italian Evening - wines of Tuscany & New Season’s Olive Oil – on November 8th. Must say I’m enjoying some great coffee these days. Many of you will know from recent media coverage that Robert Roberts won a 3 Gold Star Award for their widely available Java Coffee Beans but the coffees that I have at the moment from the long established Dublin firm are from Central and South America. The Cuban Altura, an earthy smooth flavoured cupful, is now almost used up. Most of Cuba’s coffee is grown for the local market and for some limited export markets. Glad that this came our way. The September selection from Roberts is the Bolivian Nakhaki, smooth and regarded as “very sweet”. Didn’t really notice any great sweetness, the term is relative anyhow, but found it well balanced and creamy. Up until recently, the coca bean was the main crop in Bolivia but it is now recognised that they have the rich soil and ideal conditions for growing top class coffee. This is one of them! And the top class standard continued with a recent purchase from the Golden Bean Roastery which is based at Ballymaloe House. I bought my pack at the Mahon Point Farmers Market. The Yirga Cheffe comes from the highlands of Ethiopia. This is a lovely coffee, bright and crisp, fragrant, with a slightly chocolaty or nutty quality and a bit stronger than you might expect for its light to medium body. Maybe use just a little less coffee when brewing up your cup! As part of its 25th anniversary celebrations, Glenisk has partnered with the Marie Keating Foundation, donating €25,000 to help the charity raise awareness of breast cancer, promote screening and prevention measures, and help those families who have been adversely affected by the illness. Glenisk has created a series of Limited Edition Pink Yogurt packs to highlight the partnership across the company’s Fat Free Organic yogurts, which are available in Natural (500g), Strawberry (4x125g) and Tropical Fruits (4x125g). In addition, Glenisk has set up a small fund on their Facebook page, inviting visitors to apply for ten community support grants of €250 each. The funds are for events or fundraisers which help to make a difference in local communities around Ireland. Community organisers and charities can apply on Facebook. Further information on all Glenisk products, partnerships and organics is available at www.glenisk.com, on Facebook and on Twitter. “In association with On The Pig's Back, we are delighted to announce a Cheese & Wine Masterclass taking place on Wednesday 3rd October @7pm upstairs in our Wine Workshop. A Tasting of 6 Cheeses & 6 Wines carefully selected for each cheese to teach you about cheese and wine pairing. You can experiment with the different combinations & find the best match for yourself." Admission €15. Spaces are limited so booking is essential. Send them a message on FB, or call 021 2390219 or email info@latitude51.ie to book your spot. Don’t forget the 'Margaret River comes to East Cork' event at Ballymaloe, this Thursday 27th September. 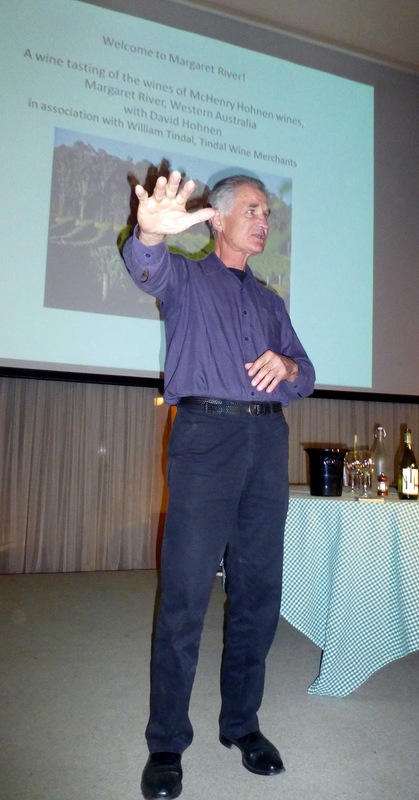 Well known winemaker, David Hohnen (formerly of Cloudy Bay, which he established, and Cape Mentelle) oversees a Margaret River wine presentation, followed by a 'Fire-cooking Harvest Supper' by Wildside's Ted Berner - more details here at this link. Congrats to St Tola who won two Awards this week at the Irish Cheese Awards! Their lovely Ash log won Silver in the New Cheese Category while their classic St Tola Log won Gold in its class! 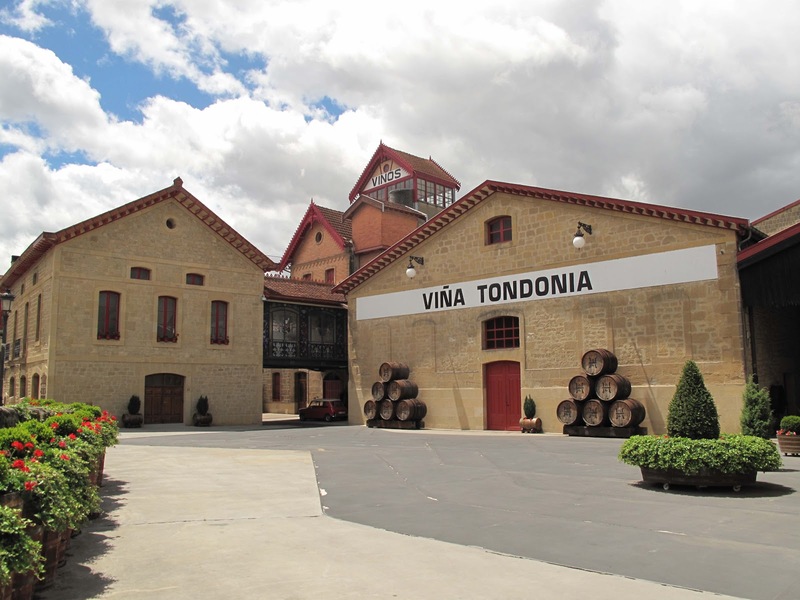 R. Lopez de Heredia Viña Tondonia, Viña Gravonia Crianza 2002, Rioja DO, 12.5%, €11.00 (at the vineyard bodega in Haro). So we had a taste and yes it is dry. The colour though is like rich honey and there are gorgeous floral blossoms on the nose. On the palate, there is a soft explosion of beautiful exotic flavours but, while rich, the aged wine is well crafted and well balanced, all leading to a very pleasing, lingering dry finish. This is surely something different and very highly recommended. Door to the tasting room! Colour: Pale gold slightly evolved. Nose: Fresh and aromatic. Complex and developed. Bouquet with aromas of third generation. Taste: Fruity, complex, developed and fine.Issued Quantity: 29.000 bottles. R. Lopez de Heredia Viña Tondonia, Viña Tondonia Reserva 1996 Rioja DO, 12.5% abv, €20.00 (at the vineyard bodega in Haro). The nose is complex and the colour is even richer than the Gravonia, red/gold, like a good whiskey. I was told the extra richness in the colour comes from the ten per cent Malvasía used; the rest is Viura. Even though I had been told it was dry, I was still expecting something sweet. But, yes, it is really dry. It is also rich and elegant, shaping up like a good smooth sherry before finishing long and dry. Gorgeous. Very highly recommended. 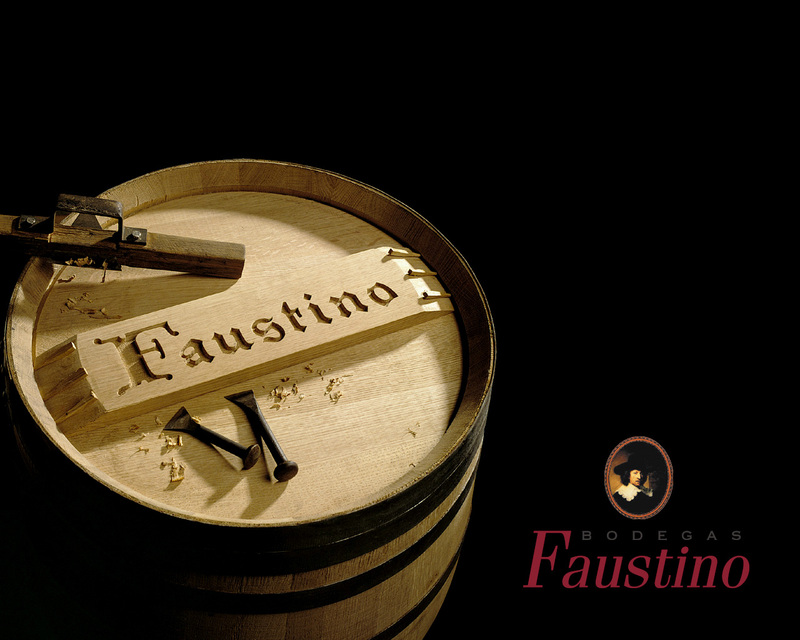 It has spent six years in barrel and just 20,000 bottles were produced. They say it is perfect with all kinds of fish, with seafood and well seasoned white meat. Vineyard notes: 1996 was officially a good year. There was a perfect balance in all parameters: colour flavour and taste. The white wines keep evolving in a fantastic way, showing elegance and finesse as per the best vintages. I had been hoping to get some of their famous Viña Tondonia Rosé Gran Reserva, another aged wine, but there was none available and, because it is not made every year, none will be available for another year or two. 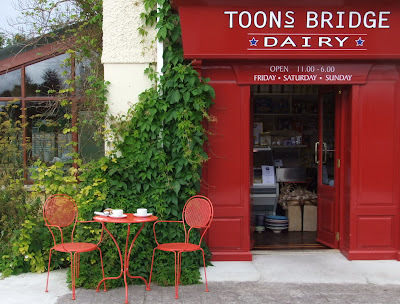 The Real Olive Company and Toons Bridge Dairy this summer opened a little shop beside their warehouse and buffalo dairy in the old creamery, Toons Bridge, near Macroom, West Cork. "We sell our buffalo milk produce (mozzarella, ricotta, butter, raw milk, aged cheese, cream cheese and yoghourt) and our Mediterranean foods (olives, oils, Iberico meats etc.) 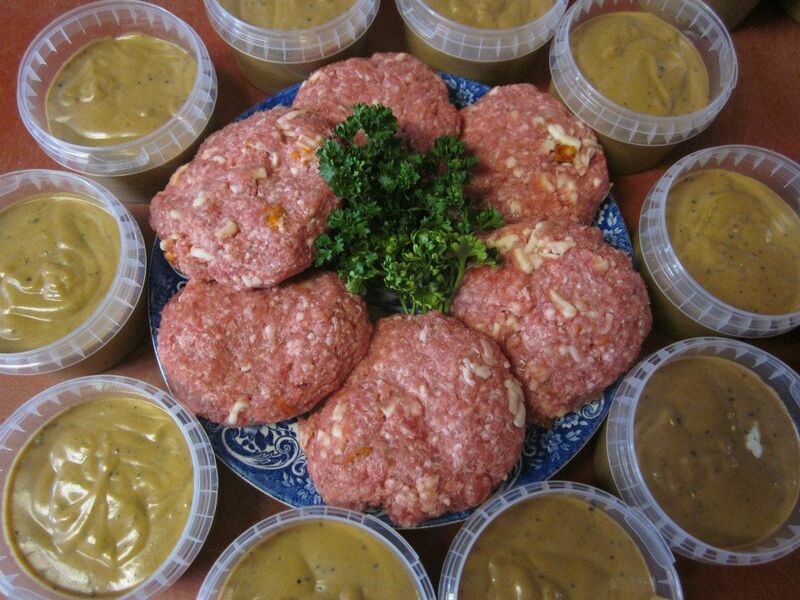 We also provide an outlet for other local artisan producers (De Roiste puddings, Coolea cheese, jams etc.)." "Attached to the old creamery there is a pretty garden, where we grow lots of the herbs and edible flowers used on the olive stalls." 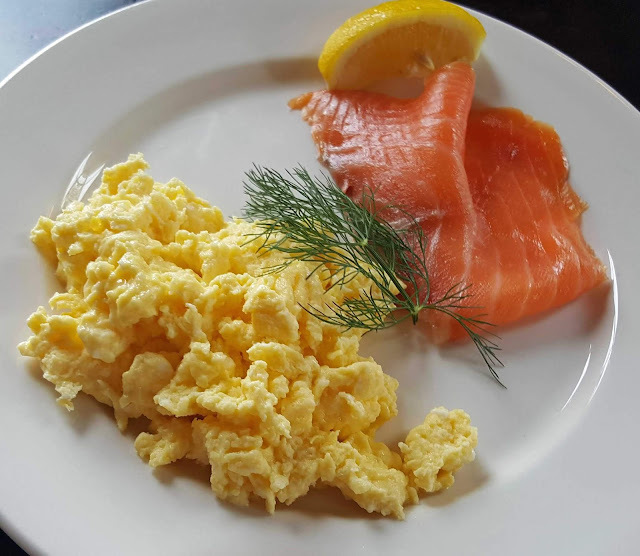 On Friday 28th Sept. We will open a cafe in the creamery garden serving simple food made from the abundant ingredients on site as well as good coffee, organic wine and sherry and scrumptious homemade desserts. Please note: Both shop and cafe will only open Fri, Sat and Sun because the stalls and vans are gone all over the country to markets, the cheese maker has finished his week and all is peaceful at the creamery. Jaipur Restaurant Dublin came to Cork’s Farmgate for Culture Night and their team of chefs got a surprise. “We’re doing okay but no one told us about these queues,” one said. And they did more than alright as the punters flocked in last night. And so too did the Farmgate team, keeping the flow going and organising seating for everyone. Jaipur showcased the pan-Indian way of serving a complete meal at the local market eateries – The Thaali. 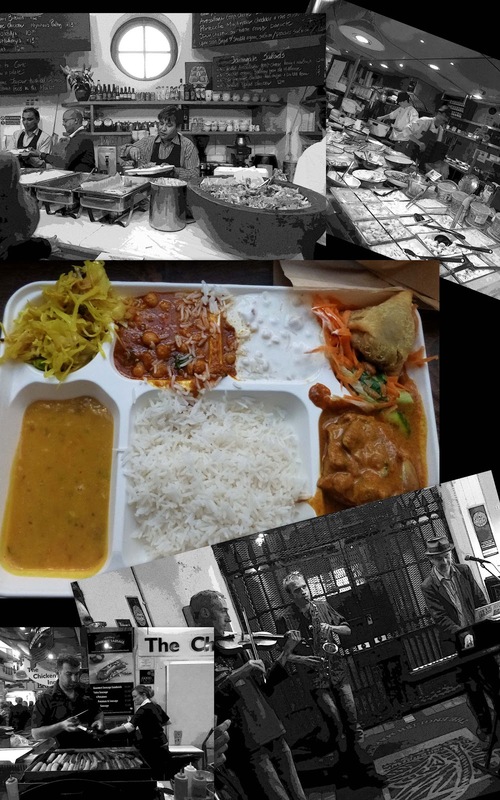 Food is a very communal experience in India and Jaipur applied their flair and expertise to recreate the flavours of India in Cork’s historic food market, The English Market. And, from all around me, I heard the diners praising the essence of ‘India on a Plate’! While, for me, the Farmgate event was the main one, there was a lot more going on in the Market with lines of people building up at every stall that was serving food. Not to mention drink. Bubbles Bothers reported a mad mad night. Maybe we should do it more often! Spent a pleasant interlude yesterday in the Fresco Bistro and was once again reminded of the excellence of the place in terms of variety and value. With the college “populating” itself again, the restaurant was busy enough for lunch but deserves to be better known and better supported. There is terrific value here, quality too of course, as one would not be much good without the other. Almost all the specials on the board were under a tenner. Just the day before, I had a very ordinary carvery Roast of the Day (Bacon) in a suburban pub; meat and veg were fine but the potatoes were rock hard and it cost €12.99. Not great quality and no great value there. That dish would end up at the bottom if put in competition against anything at Fresco. The variety at the Glucksman restaurant was underlined when we got a plate full of hot tapas and two glasses of wine, all part of a discount scheme now reaching its conclusion. The tapas are not a regular item on the menu and we had to ring in advance. 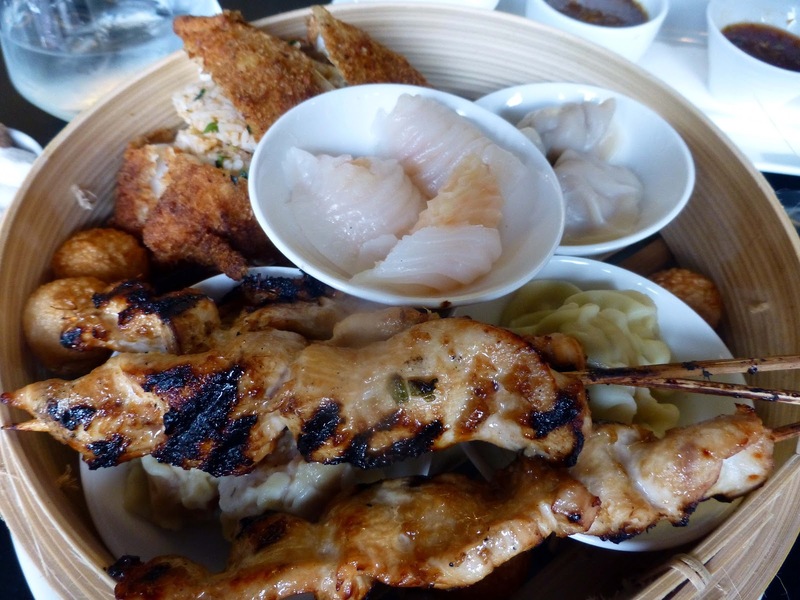 We enjoyed a brilliant selection, all with an Asian touch: chicken, pork, beef, calamari, fish, prawns and more. They came with three brilliant sauces, sauces that didn’t come out of a bottle: Satay, Sweet chilli and Raita. I had been looking at the dessert specials on and off during the tapas and couldn’t leave without trying. 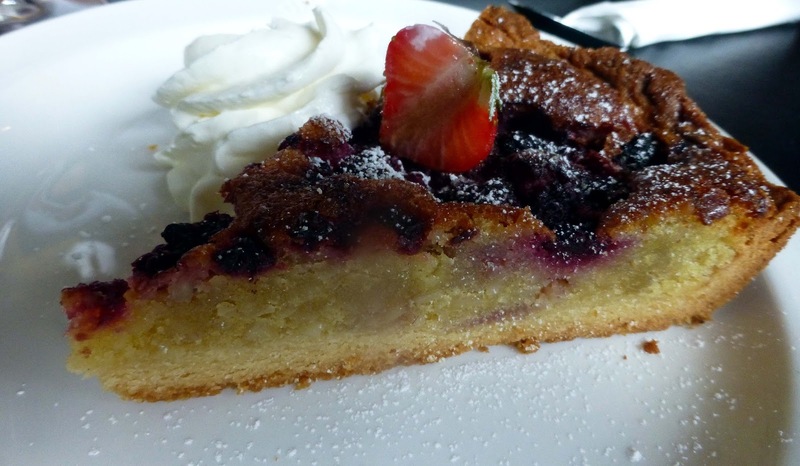 We picked the Mixed Berry Tart (€4.00) and Jamaican Rum Banana and Fruit Tart (€5.00). Had a half of each and, hours later, I’m still very contented! So well done to Brian and Chef Kash along with their very pleasant and efficient staff. Keep up the very good work and hope to see you all again soon. 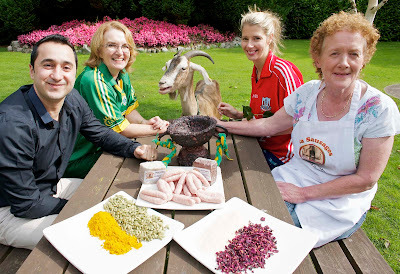 Arun Kapil, Green Saffron Spices, Cork; Mary Beary, Taste Kerry; Ciara McGee, South Cork Enterprise Board; and Kathleen O'Connor, Sasta Sausages, Killorglin, Co Kerry; with Amber, Ardsallagh Goats Cheese; at the launch of the Inaugural Cork / Kerry Food Forum, which takes place at the Rochestown Park hotel on 1st Oct. The Cork Kerry Food Forum 2012 is to be held at the Rochestown Park Hotel on October 1st. There will be workshops, exhibitions, a conference and one to one mentoring sessions. Get all the times and details here. More than 200 people involved in the region’s burgeoning food sector will meet with Minister for Agriculture, Food and Marine, Simon Coveney T.D., at the forum which is aimed at SME food producers, buyers, retailers and distributors who are keen to further their knowledge of the Irish food sector which is worth more than €20billion to the economy. Read more. 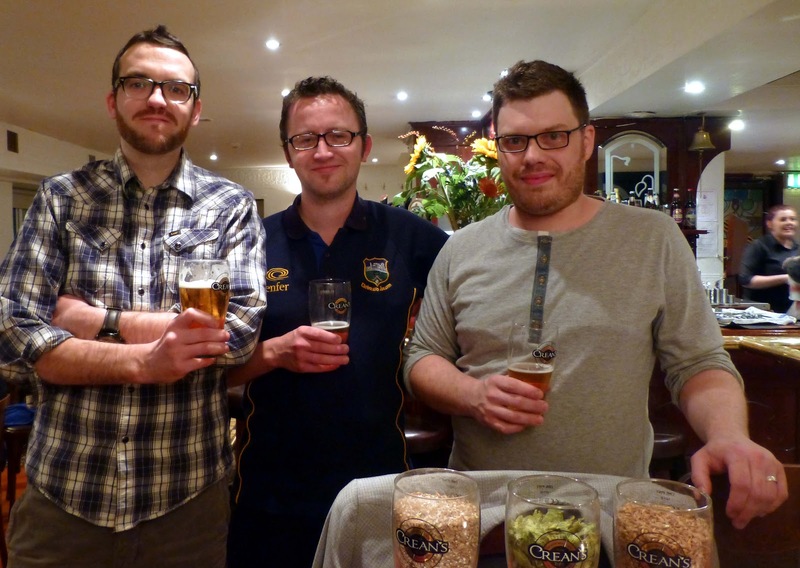 Storytelling Southeast, a festival in Dungarvan which has been developing its Celtic connections with the French region of Brittany where Storytelling is a popular culture, will this year for the first time host a 'Taste of Brittany' artisan food market. From Thursday, September 27 to Saturday, September 29 the 'Bretagne Excellence' producers will feature at Dungarvan Castle with some of Waterford finest food producers creating a Celtic market of the first artisan foods at 'Village Breton'. 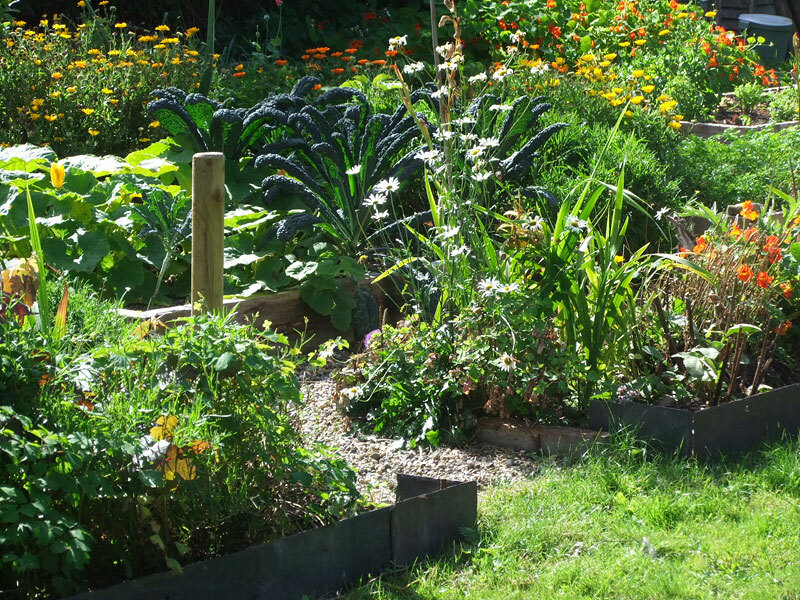 Despite the wettest summer in 40 years, the house has been buzzing, the glamping has been in full-swing, the gardens have been blooming and exploding with veg and the weddings have gone well. ITV has also been filming here with actor James Nesbitt. He is presenting a travel show about Ireland - due to be broadcast in March 2013. Veronica will be sharing her life philosophy with us at the Bandon Arts Festival on Sat 29 Sept 5.30pm in Urru. Details. Sunday afternoon’s trip to Ballymaloe proved to be a very rewarding one. Not alone did we taste some terrific wines from New Zealand but we were entertained and educated by two of the beautiful country’s top winemakers, Larry McKenna of Escarpment and John Hancock of Trinity Hill. Ironically both are Australian and went to High School together. They later combined in an early venture in New Zealand before going their separate ways. 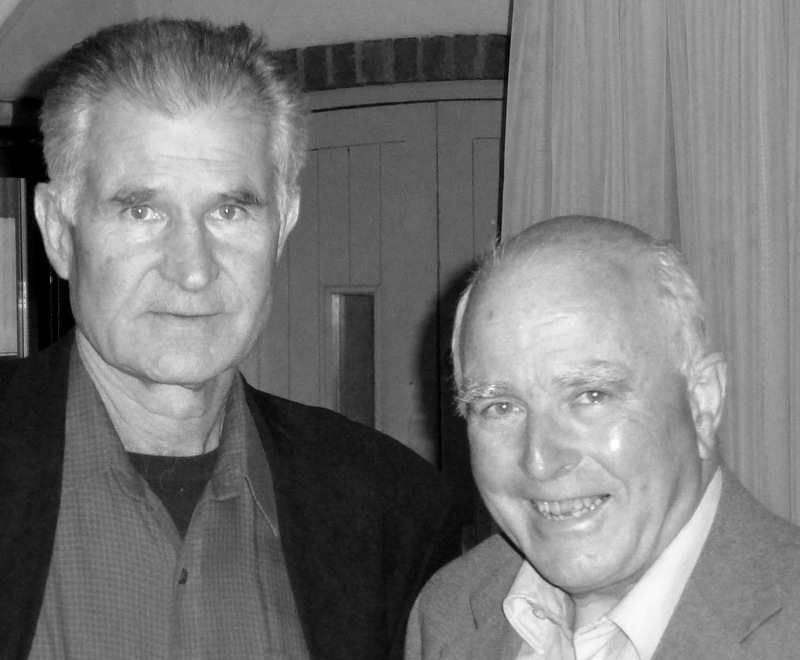 They are still great friends and a terrific combination at evenings such as this. While John recognises the importance of terroir Larry, also known as Larry McPinot, is “unashamedly a terroiriste” and tries, very successfully, to emulate Burgundy. The pair were introduced to the Grain Store audience by Anthony Tindal of the Tindal Wine Company, their distributors in Ireland. John told us that Trinity Hill has been established for just 15 years as he introduced the first pair of his wines. The first up was the Hawkes Bay Pinot Gris 2011. Beautiful aromas, “Turkish delight!” John said. Even though the wine is a dry one, it has a magnicient texture and fullness and “makes food look good”. This is perhaps the best Pinot Gris I’ve tasted. Then we tasted the Gimblett Gravels Viognier 2011, another standout wine and again one of the best Viogniers I’ve tasted. Loved its apricot and floral aromas, the rich and soft texture. John recommended trying it with Asian food. The next wine, the Gimblett Gravels ‘The Gimblett’ 2008, was built to last longer than the Merlot. Is uses the traditional five varieties of Bordeaux (Cab Sauv 43%, Merlot 41%, Petit Verdot 7%, Malbec 6& and Cab Franc 3%). “The fruit is from low yielding vines. It is more intense, more concentrated. It is made to age and needs it. It spends 18 months in oak, has good depth, is well balanced and will age for another five years. A food wine!" All along the evening, the pair had some good discussions and good answers to questions from the audience. Larry told us that almost all the wine is made on the sheltered east coast as the NZ weather comes from the west, just like Ireland’s. John explained that tannins come predominantly from the skins, also from the seeds and pips, and give the wine that grippy feeling while Larry said that, without tannins, wine has no backbone. While Larry grows Pinot Gris, Pinot Blanc and Chardonnay on the Escarpment, the site is “a great place to grow Pinot Noir”. It is a bit of a Prima Donna – Larry described it as genetically instable – but he does very well with it, as his four examples underlined. First up was Escarpment The Edge, Martinborough 2011. “No oak, simple..fruit driven..for immediate drinking.” Simple maybe but still full-bodied and with a lingering finish. The first two were good but the second two, each from a single vineyard, were even better, described as absolutely beautiful by Anthony Tindal and virtually everybody else I spoke to. 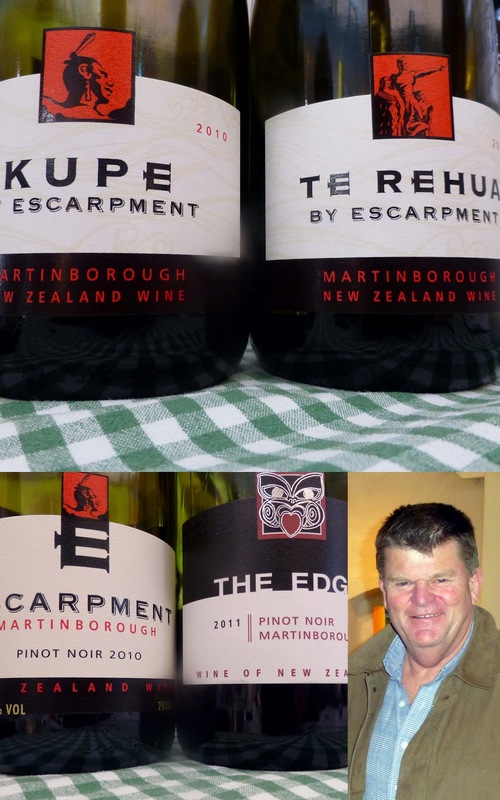 The Escarpment Te Rehua Pinot Noir, Martinborough 2010, showed how well Larry emulated Burgundy, though his site has its own characteristics of course. Made from 25 year old vines the wine showed unique complexity along with the usual black cherry and plum flavours. Nice stories too behind the labels and you can read all about them here. 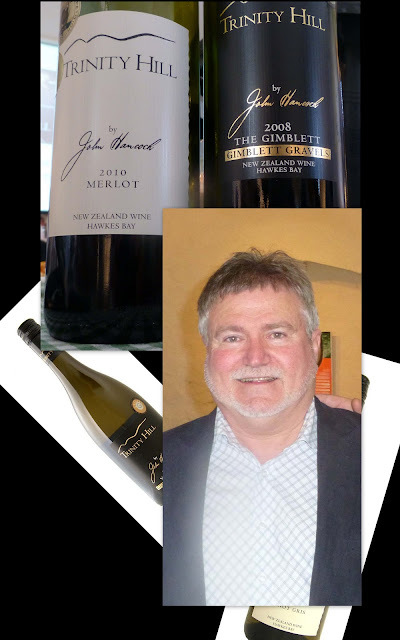 For more info on John’s wines check Trinity Hill. 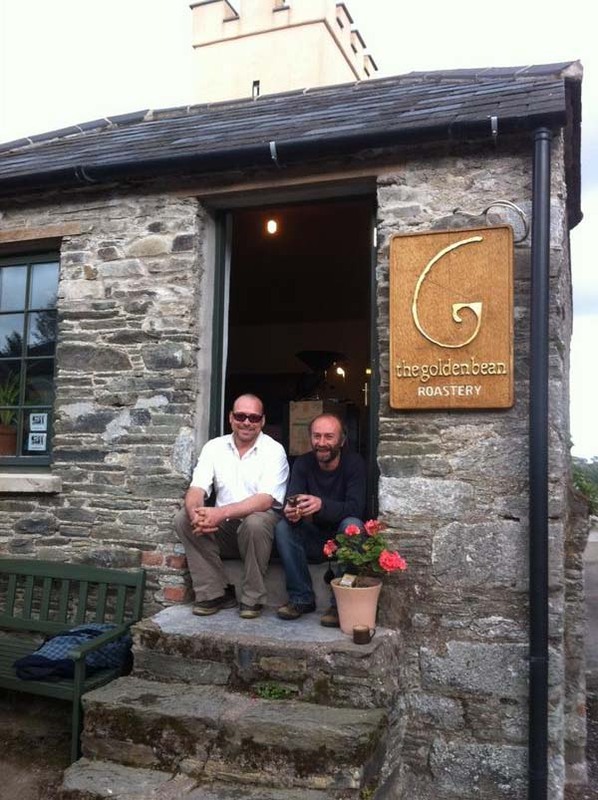 Alain from the Vanilla Grape in Kenmare enjoyed his trip to Ballymaloe and he stocks the wines. There is a discount available at present and to see more about the wines in Ireland check Tindal Wines. Remember when using the internet that while a company may have with 100s of wines in stock, they may not all be listed on the site; sometimes you may have to phone. 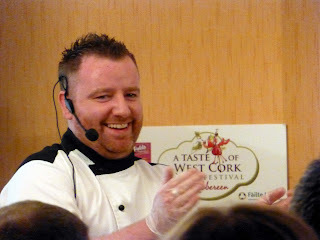 Some of the top food producers and suppliers in West Cork were gathered in the ballroom of the West Cork Hotel in Skibbereen last Wednesday as part of the week long A Taste of West Cork festival, specifically there in the morning so that the visiting chefs for the evening’s highlight, the Celtic Cook-off, could sample and choose from the produce. Delighted to get an invite to the morning session and meet up with some old friends from the markets and also meet some new ones. Manning’s Emporium from Ballylickey had a stand groaning with some of the best cheese around: Durrus, Coolea, Gubbeen, Fermoy etc. and Val and Andrew were in top form. 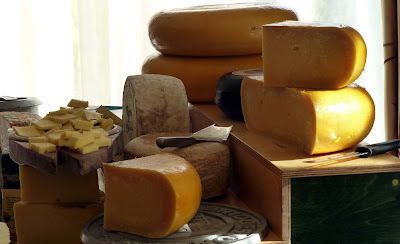 More top notch cheese too at the Milleens stand where Quinlan Steele was on duty. Frank Krawczyk, a citizen of the world who loves his West Cork home, is one of Ireland’s best known salami and sausage makers. 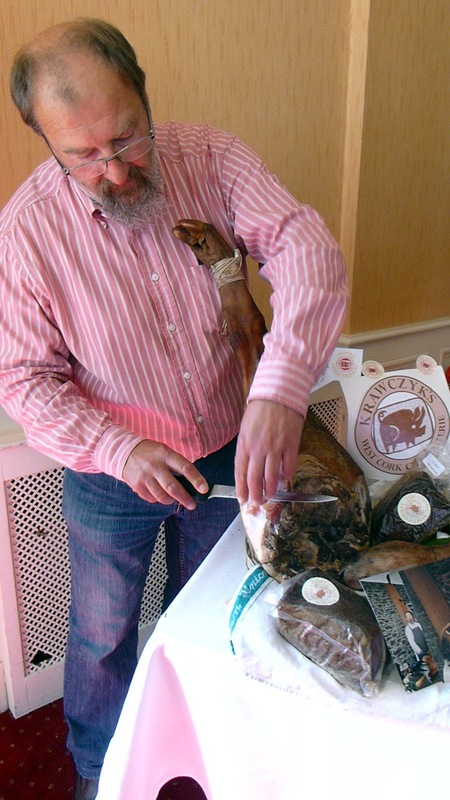 Loved his Bresaola and his treatement of a shoulder of pork, both tasty and moist, not to mention his cured ham. 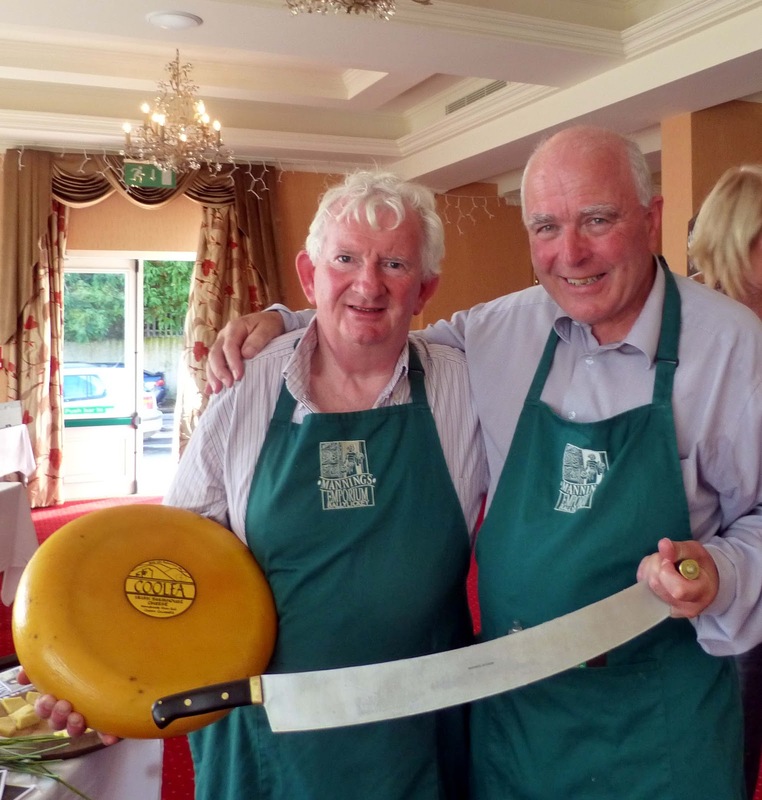 Frank, based in Schull, gives regular demonstrations at Ballyvolane House and O’Brien’s Chop House. Axel and Marye Miret are the couple behind West Cork Garlic and their product was used by winning chef Garry O’Hanlon. Caroline Hennessy was on the 8 Degrees Brewing stand and she was displaying the full range of their popular beers. 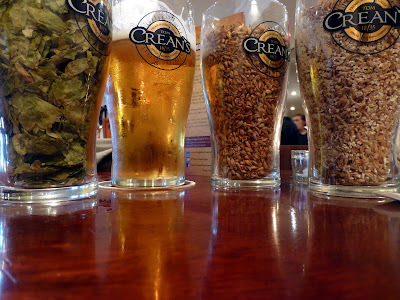 Saw the ale again on the Friday, on tap in Cork’s latest craft beer pub, the Hub in Anglesea Street. Two of the four people on the Celtic Cook-off working group, Avril Allshire of Rosscarbery Recipes and Sally Barnes (“the greatest fish smoker in the country”, according to one Tom Doorley) of Woodcock Smokery were both busy at their stands. Lingered also at the Skeaghanore West Cork Duck stand, for the conversation and also for a sample or two. 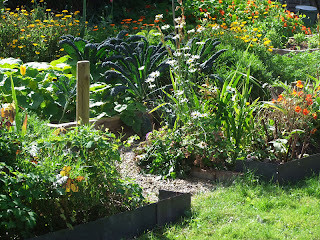 Here they like to keep it simple, natural and additive free. Read all about this wonderful product here. The chefs had been down to the coast earlier in the mornings so there was no fish stand in the ballroom but the sea wasn’t forgotten as we met Sally McKenna of Bridgestone Guides and Jim Kennedy of Atlantic Sea Kayaking. They had a very impressive display from the sea and the shore including Dilisk, Carrageen Moss, Sea Spaghetti and Wrack and more. Tasty stuff too and Masterchef winner Tim Anderson was shopping there. Got to most of the stands but missed out on a few, including Brown Envelope Seeds. All of the suppliers were back for the Cook-off in the evening and the stands were kept busy as hundreds of people squeezed in. A few more producers came too, including Glenilen and Matson’s Wine and Food Store of Bandon who, with Searson’s, were supplying the matching wines for the cook-off meals. Matson’s are offering 20 per cent off on the show wines for the next while. I got a taste of one of them, the Vallado from the Douro, a terrific red, easy drinking and delicious. All in all, a great experience that underlined once again the quantity and quality of the producers in the area. And, another thing, these are friendly folk. So why not put the festival in your diary for September 2013. You won’t regret it! "We are delighted to announce this unique wine, food, & sporting event, to take place on Thursday 27th September, at Ballymaloe House which connects two lovely coastal areas of the world - Margaret River, Western Australia and Shanagarry/Ballycotton Bay, East Cork. Afternoon - Cricket with the East Cork Cricket Club, in association with Cricket Ireland, who will give a demonstration on the lawn at Ballymaloe, and explain the rules of the game to all. Have a go yourself – ‘learn the basics whilst trying out the game’. There will also be a demonstration on the sport of kite surfing – linking in with the theme of the day – Margaret River comes to East Cork!" Enjoy a Margaret River wine tasting & presentation, with iconic Australian winemaker, David Hohnen, in The Grain Store, Ballymaloe featuring the wines of McHenry Hohnen, followed by Wildside’s Ted Berner’s ‘Fire-cooking’ Harvest Supper. Great to eat outdoors under the sun and even better to eat something special. 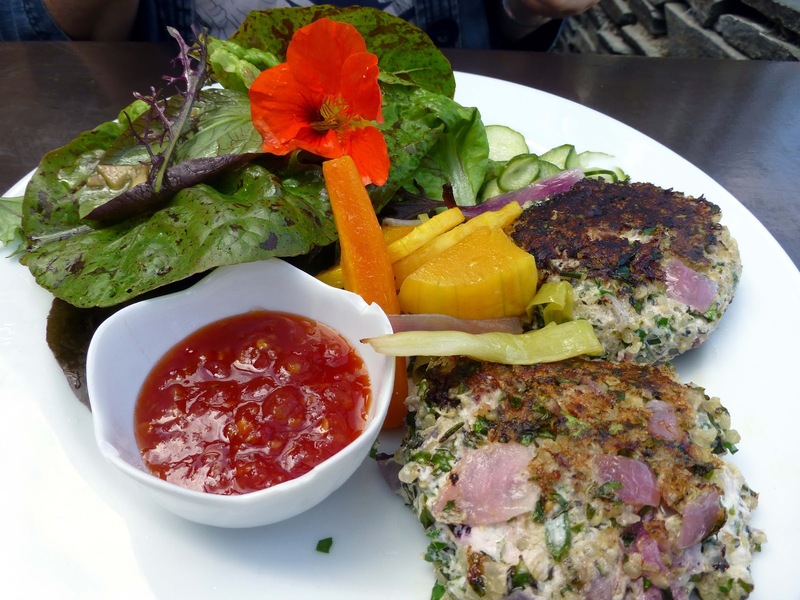 I enjoyed just such an occasion last week in the Cafe at The Glebe Gardens in Baltimore, a terrific location with innovative cooking and very friendly staff. They do have an indoors but we ate in a courtyard type setting, out there with the birds and the bees, the sun shining and the specials on the board. CL picked the special soup: Courgette, Pea and Mint (€6.00). The balance of the ingredients was finely judged and, along with some gorgeous bread, with seeds inside and out, it was a terrific start. I was just as happy with mine, The 3 Fish Chowder (€8.00), a regular item on the menu. It was described as a large bowl of chowder. It sure was large and it was also top notch. Also got the seeded bread with that. We both agreed on the main course: Goats Cheese, Quinoa and Herb fritters, served with a garden salad (the garden is behind the wall), and Glebe tomato and chilli jam (€9.50). Again, a terrific combination of ingredients with the spicy and herby bits enhancing, rather than overpowering, the main ingredients. Really top class and at a decent price. We should have been satisfied at that point but with class cooking so far, there was no way we were going to skip dessert, especially since we had been tempted all along by that big blackboard on the opposite wall. 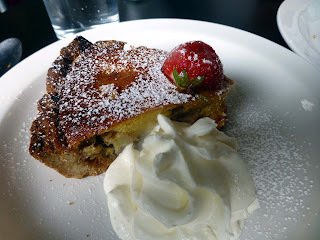 I picked the lovely Peach and Almond Tart, excellent and well balanced. 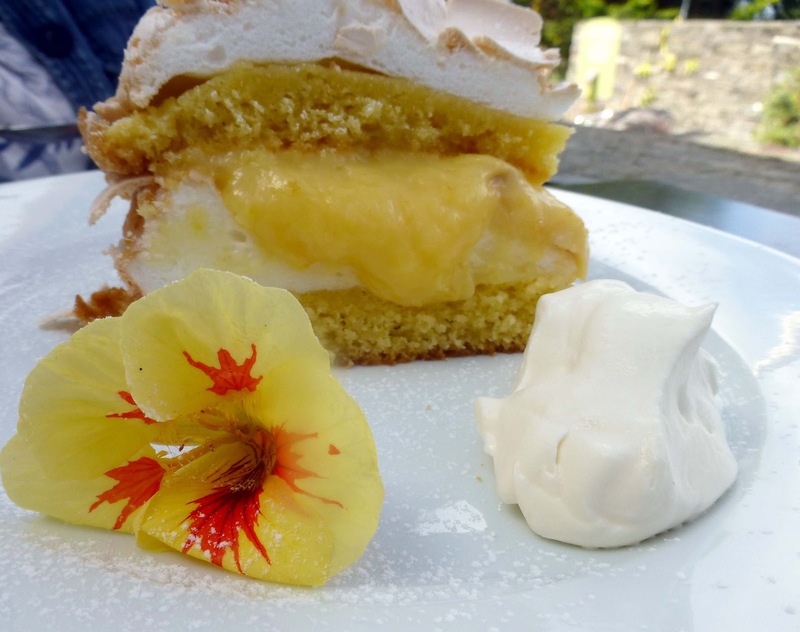 But the best looking dessert was at the other side where CL was tucking into the Lemon Curd Meringue Cake, easy on the eye and so sweet to eat. “The best dessert I’ve ever had,” she declared. Begged a few spoonfuls and agreed it was something else. A pretty photograph for sure and a delightful dessert for certain. Each dessert cost a fiver. We were in the area for the fabulous Taste of West Cork festival and the Glebe told us they were also taking part. A treat indeed for those lucky punters who booked their “From Plot to Plate Evening”. Watch out for that event next year but you’ll be welcome at The Glebe anytime. Not quite anytime – make sure to check the site for opening times. Oh, one more thing: they don't accept credit cards. Highly recommended. 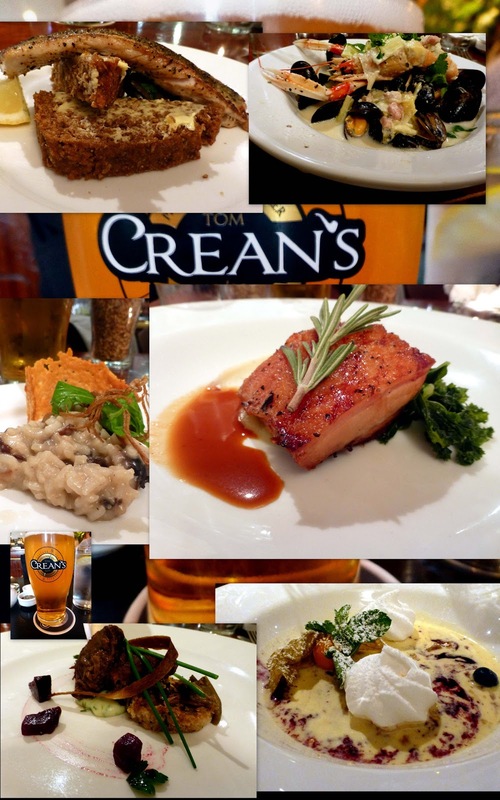 It looks as if all six Celtic Cook-off chefs enjoyed this week’s visit to West Cork and hopes are high that some of them will be back again, following the example of Roy Brett the 2011 champion. 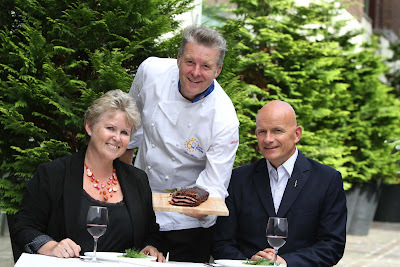 Roy, whose restaurant is the Ondine in Edinburgh, was guest chef at the West Cork Hotel on Tuesday night where he displayed his talents with a fantastic meal called A Taste of Ondine, one of the highlights for the week. It was a sentiment echoed by Jack Stein who served up a dish of Monkfish Cheeks as his meal in the Cook-off. “Food, culture, music, all the same thing,” he said, echoing the words I heard not too long ago from Kay Harte of Cork’s Farmgate. Interview by MC John McKenna, Stein went on to emphasise the part that these elements, food in particular, can play in improving local life and keeping the kids at home. “Good restaurants draw people in and extend the holiday season”. A point emphasised by the fact that the Stein organisation in Cornwall employs some 450 people! Stephane Delourme (from Brittany) also works with the Stein company, at the Seafood Restaurant in Padstow. Before that he worked in Dublin and was a regular visitor to Baltimore which he loved. He has noticed a huge improvement in Irish food over the last 13 or 14 years. He served up a dish of Dover Sole with local mussels, vegetables and beans from Brittany. There was a big welcome for Wales representative Ian Bennett (of the Welcome to Town Restaurant) and he spoke of a fairly similar food scene in his native country where his fisherman rings him from the boat and tells him what he has. “You can’t get fresher than that!” Not surprisingly, fish featured in his dish: Union Hall Turbot with mussels, parsnips and Stonewell cider. By the way, we weren't supplied with a list of ingredients for the dishes so my lists are not complete! Tony Singh, the man who “brought cocktails to Edinburgh” is co-founder of that city’s acclaimed restaurant Oloroso. He said we had fantastic produce here and used lamb and langoustines, spicy potato and a minted herb salsa verde. MC John McKenna praised Tony for using the spices “with sympathy and knowledge”. Baltimore seafood featured heavily in Butch Buttery’s dish. Among many other roles, Butch is chef and recipe consultant for the Manx Organic Network and Island Seafoods. Langoustines, lobster, prawns, mussels and monkfish, even Sally Barnes’ fabulous smoked haddock, not forgetting his Isle of Man scallops (each chef was allowed an ingredient from home) were all added to the Bisque type mix. Neil had praise for Clare Gallagher, chairperson of the organising committee, for Avril Allshire, and Sally Barnes and Stephen Sage, his colleagues on the Working Group. It was a very enjoyable evening, though I thought the visual delivery to the 200 plus audience in the ballroom lacked a bit but I’m told they are working on that for next year. So onwards and upwards with the Celtic Cook-off. The more we pull together the further we will go! Irish beef has been selected as a key ingredient for Bocuse d’Or, the esteemed French and world renowned, culinary competition. The Bocuse d’Or held every two years in Lyon, France, is regarded as the most challenging and prestigious haute cuisine cooking competition. The selection of Irish beef, following a rigorous and lengthy process by the Bocuse d’Or International Organisation Committee, was based on its grass fed nature meaning the product is of a high quality in terms of tenderness, taste and texture. Securing this much sought after accolade is an invaluable endorsement and recognition of Irish beef. Referred to as the Olympics of the culinary world, the Bocuse d’Or was pioneered and named after a 3 Star Michelin Chef, Paul Bocuse, in order to broaden the public’s understanding of the extraordinary dedication, practice and precision required to execute the very finest cuisine. Securing a place as a chef in the Bocuse d’Or Finals is an honour in its own right and involves months of preparation and planning whilst beating off stiff competition in the World Series of qualifying rounds and heats. The Steele Family, founders of Milleens Cheese and pioneers of cheese making in Ireland, will be at Bandon’s URRU on September 29th for a special event. 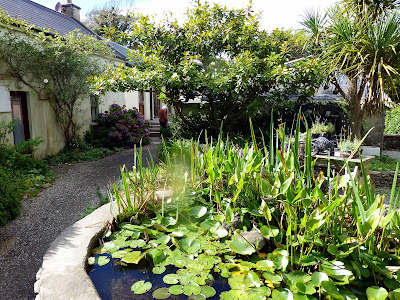 The Art of Living – in conversation with the Steele Family will take place as part of the Bandon Arts Festival on Saturday, September 29th at 5.30pm in Urru Culinary Store, McSwiney Quay, Bandon. The around-the-table conversation will be led by West Cork based food writer Dianne Curtin and active audience participation will be encouraged. Milleens cheese based canapés and refreshments will be served.There is no entry charge for the event however as space is limited to 30 people early arrival is recommended. Well, maybe not that royal palace, but McCurtain Street restaurant Green’s are stepping up to the plate in a big way this weekend to help their neighbours, The Everyman Palace Theatre. The Palace has a double Tom Murphy bill on this Saturday, one show (A Whistle in the Dark) at 3.00pm and a second (Conversations on a Homecoming) at 8.00pm). Greene’s will help feed the assembled troops and will open an hour earlier (5pm) Saturday, to feed those of you who'd like to dine between watching the Druid Murphy double bill! That’s the way to do it. The more we pull together, the further we will go. The Guinness World Oyster Opening Championship will take place on Saturday 29th September in the festival marquee, 12pm-7pm. The 58th Galway International Oyster & Seafood Festival and will see contestants from 20 countries around the globe battle it out to become the 2012 World Champion! Tickets are €70 and include admission, half a dozen oysters, 2 tastes at the Food Village, a complimentary beverage and non-stop entertainment from 12pm-7pm. If you like books and food, then Kilkenny’s Graignamanagh is the place to be on Sunday 23rd according to Twitter’s ‏@TownOfBooksFest. 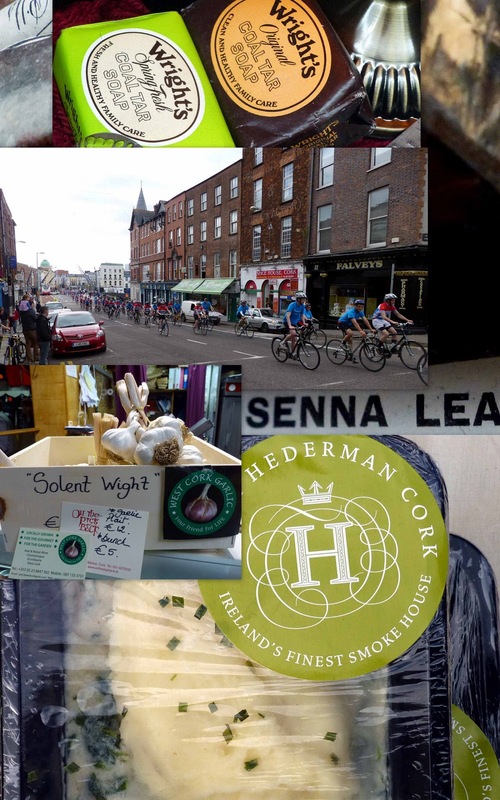 They have an artisan food & craft market on on the Sun 23rd (11.00am to 5.00pm), featuring chef @EdwardHayden. The bookfest by the way starts on the Friday and you may see the full programme here. @tastewestfest - Join us for a bite at Taste of Westfest Sat 15 & Sun 16 Sept, Newcastle West, Co Limerick - part of the Knights of Westfest Music extravaganza 12-16 Sept.
On Saturday 29th September 2012 - 8:00pm in the Temperance Hall, Emmet Street, Kinsale, go and see Betrayal, A One Man Play By Bill Griffin, in support of Breakthrough Cancer Research. Not a food event, but a good cause. Donegal man Garry O’Hanlon came out in top in the Celtic Cook-off at a packed ballroom in the West Cork Hotel (Skibbereen) last night. 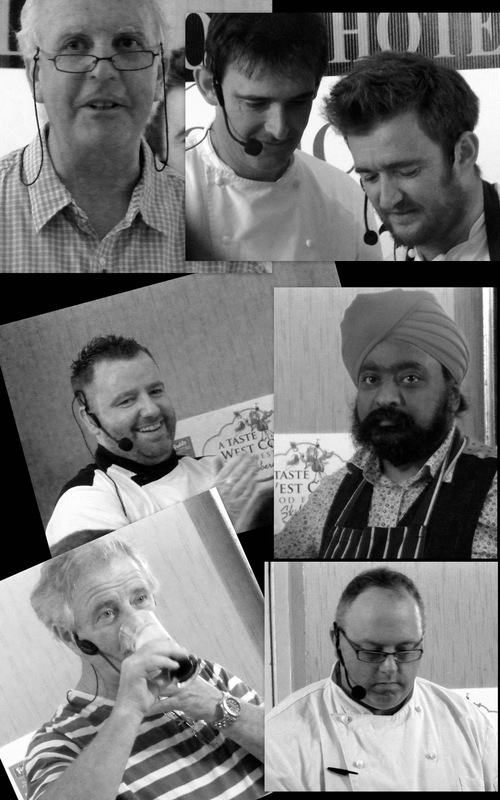 MC John McKenna said that all six chefs were winners but Garry got the nod in a very tight contest. Representatives from the other five Celtic territories included Jack Stein (Cornwall) son of restaurateur, chef and TV presenter Rick Stein, Ian Bennett, The Welcome to Town (Wales), Stephane Delourme, The Seafood Restaurant, Cornwall (representing Brittany), Tony Singh, who owned Oloroso Bar and restaurant for over 10 years (Scotland), and Butch Buttery, formerly of Tanroagan (Isle of Man). The ‘Ready Steady Cook’ style cook off style event saw the master chefs split in to two groups where they each had just thirty minutes to impress the judges using West Cork artisan produce and one ingredient from their home turf. They were also assisted by three young aspiring chefs to help them with preparation and serving. O’Hanlon’s dish of Loin of Hill Lamb, with bone marrow and wild artichoke, etc, and enhanced by, among other things, West Cork Garlic with honey, just won the favour of the judges who commended Garry on his use of Irish and local ingredients. Speaking of the event, Neil Grant, General Manager, West Cork Hotel said “We were thrilled to host such a successful night again this year. The Celtic Cook Off has become a landmark food event for the Celtic regions of Northern Europe since its inception last year and we at The West Cork Hotel are proud to play host to the region’s finest chefs." He continued, “The Celtic Cook Off opens new doors to local producers and extends the export potential of their products. They also have the chance to promote their fare to top international chefs and be recognised as the “go to people” for the best artisan produce in the world”. A Taste of West Cork Food festival continues until this Sunday with a number of highlight events still to come including an intimate concert with Declan O’Rourke on Saturday night, many free cookery demonstrations throughout Skibbereen and the finale event of the harvest country fair on Sunday with more than 100 local producers exhibiting their artisan products. • We’ll have more on the event in the next few days! I’m a sucker for old vine wines and this medium red, with its aromas of dark fruits (cherry and plum) is no exception. It is a delicious mix of fruit, spice and herb flavours, with an excellent balance and a long kiss goodbye. Indeed it is a little like that little bull Antonio that gets his pic on all the bottles: forward, but in a nice kind of way. An excellent wine at a brilliant price. Highly recommended. “As we welcome Autumn and all the wonderful harvest it brings, Inchydoney Island Lodge & Spa are delighted to announce their Taste of West Cork Autumn Food & Wine Evening which will be held at 7.30pm Friday 21st September. The Taste of West Cork Evening is a unique evening to showcase the best of West Cork produce and artisan producers. The team of Chefs are already working on combining the wonderful autumnal produce to create exciting flavours mixed with exquisite presentation. The evening will begin with a Champagne and Canapé Drinks Reception at 8.00pm, followed by a 7 course Autumn Tasting Menu, created by Head Chef Adam Medcalf and his team. Filled with flair and imagination the evening will combine the best of seasonal produce from West Cork which will be paired with wines carefully chosen by Harriett Tindal of Tindal Wines. Once you have enjoyed the Seasonal Menu and paired Wines, we invite you to complete the evening in Dunes Pub & Bistro where you can enjoy an evening of music with our Resident Musician. Tickets priced at €60, are now available and can be purchased from the hotel reception or by calling (023) 88 33143. Should you decide to make an evening of it, we would be delighted to offer a reduced rate of €75 per person sharing. Enjoy overnight accommodation in a deluxe room with ocean view terrace or balcony and in the morning wake to Chef’s full Irish Buffet Breakfast. You will also enjoy access to the heated Seawater Therapy Pool, Sauna, Steam Room, Gym and Relaxation Areas. Aherlow House Hotel Spanish Chef. Local Food. Home on the Range. Sierra Nevada. Reinforcements for Celtic Cook-off Champ! Food & Drink Spotting Updates!